Looking for plants that are beautiful to behold, yet tough as nails? Let me share with you some “sage” advice. 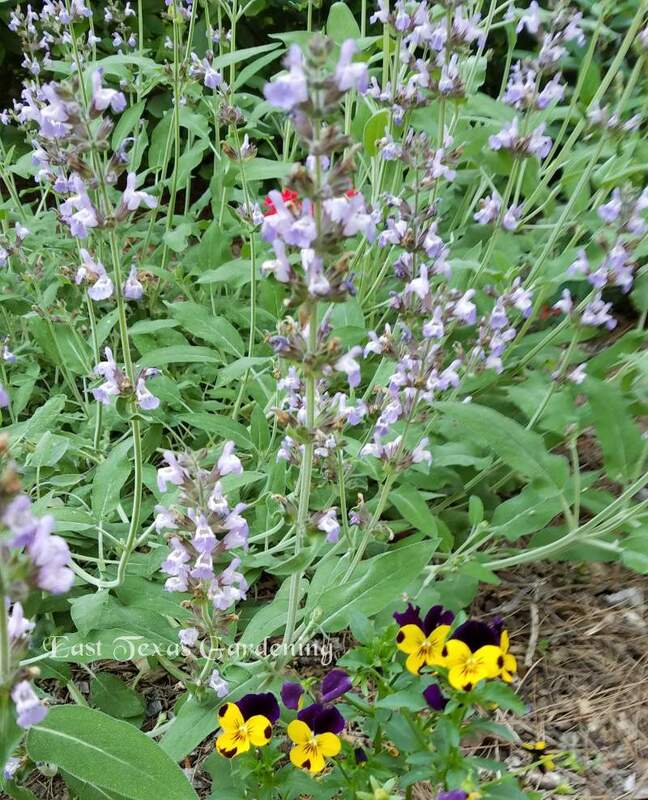 If you have a sunny spot in your yard needing vibrant color spring through fall, consider growing salvia, also called sage. There are many that will easily fill the bill. And, if you’re like me with a yard that is part sun and part shade, there are salvias for you! 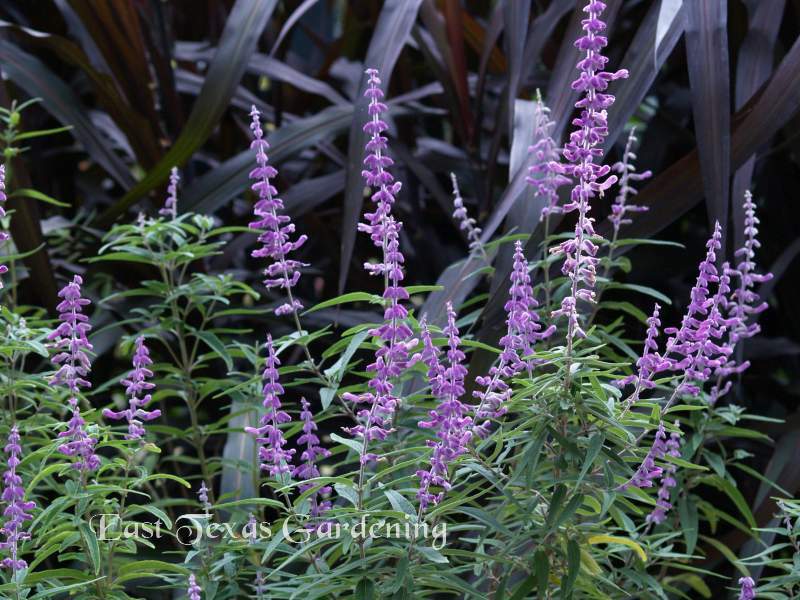 One of the most diverse and useful groups of plants for a Texas landscape are the sages - botanically known as Salvia. 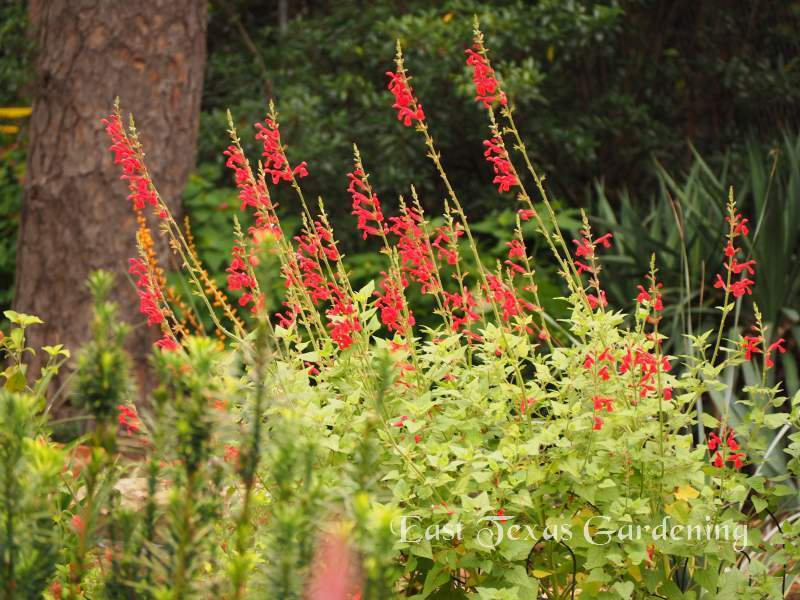 Native to many places in the world, including Texas, salvias are a staple option garden designers use to create long-lasting, colorful displays. Garden-worthy salvias range from Texas-tough perennials to tender annuals that have been extensively bred for the bedding plant market. Colors cover all the hues of the rainbow, from purple to red, with blues, whites, and even yellow. Salvias are members of the mint family (Lamiacaea) which all have the family characteristic of square stems and opposite leaves. Flowers are uniquely shaped, typically having a tubular upper lip and a two-to-three lobed lower lip hanging down, and the sepals holding the flowers are fused together. The lower lip attracts insect pollinators and acts as a landing pad. Most bees are too large to get to the nectar at the base of the narrow tubular corolla, so instead they cut a slit near the calyx for faster and easier access. Many salvia species have strongly scented foliage, such as the common culinary sage (Salvia officinalis) and pineapple sage (S. elegans). Salvia flowers are borne on spikes held nicely above the foliage where they are easily seen and appreciated, not only by us but also by a diverse range of pollinators. Sages, whether red, blue or purple, are also highly attractive to hummingbirds. Even if you do not regularly mix up hummingbird juice, these fabulous plants will provide delicious and nutritious fuel for hummingbirds all summer and fall! Salvias are hot weather plants and prefer full to mostly full sun to look and perform their best. Many salvia species bloom non-stop from spring through first frost – they are hardly ever out of bloom. This characteristic can be problematic to reluctant gardeners who are hesitant to shear back large clumps, or unwilling to remove scattered blooms on the ends of spindly stems. However, an occasional shearing is recommended to keep most varieties more compact, resulting in a new burst of heavy blooming in just a few weeks or less. Horticulturist Greg Grant says he cuts back most of his different salvia varieties every other month. You should realize if you cut them back too far or too often, then it will take longer for the flowers to come forth on the new growth. However, if you do not shear or cut them back during the growing season, they can become floppy or leggy, and varieties that set seed will cycle in and out of bloom. So, you may ask, “How far should I cut them back and when should I start shearing them?” Greg Grant says he first lets them grow to their typical height, and then begins to shear them back as they begin to cycle out of bloom. A light shearing will, of course, remove some blooms, but the result is more branching, and thus more flowers on a bushier, stouter plant. Most horticulturists recommend that you should not cut back salvias going in to the winter time after the tops die with the first really hard freeze. The reason is that they have hollow stems, and if cut back, stems can fill with water which can freeze deep into the crown of the plant at soil level, resulting in decreased winter hardiness. So, it is best to tolerate some bare stems in the garden during winter, and wait until later in February or early March to cut them back. Many of the native perennial Salvia species are very drought-tolerant once established, but most also respond favorably to occasional irrigation in the absence of rain to look their best. Like all garden plants, a layer of mulch will help retain soil moisture, and reduce or even eliminate the need for regular watering. For almost all species, they perform best when planted in well-drained soil that doesn’t hold moisture for long periods. Do not over-water or over-fertilize salvias or else floppy plants will be the result. Sages tolerate a wide range of soil pH but seem to do best in near neutral to slightly alkaline soil. Most grow equally well for east Texans with acidic soil. It's hard to go wrong with a salvia in your garden. 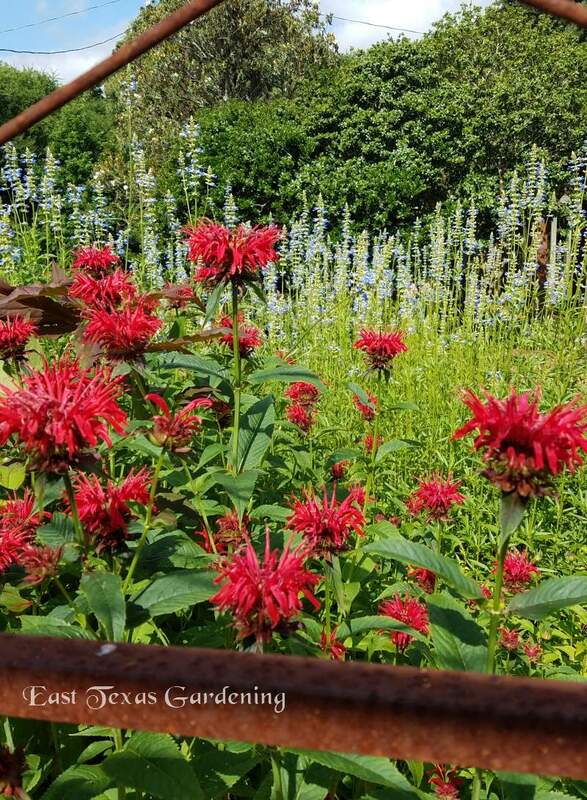 Just pay attention to their sun, soil and water needs, pick ones that will properly fill the given location, and you will have a beautiful display, and a table set for all kinds of pollinators and hummingbirds. 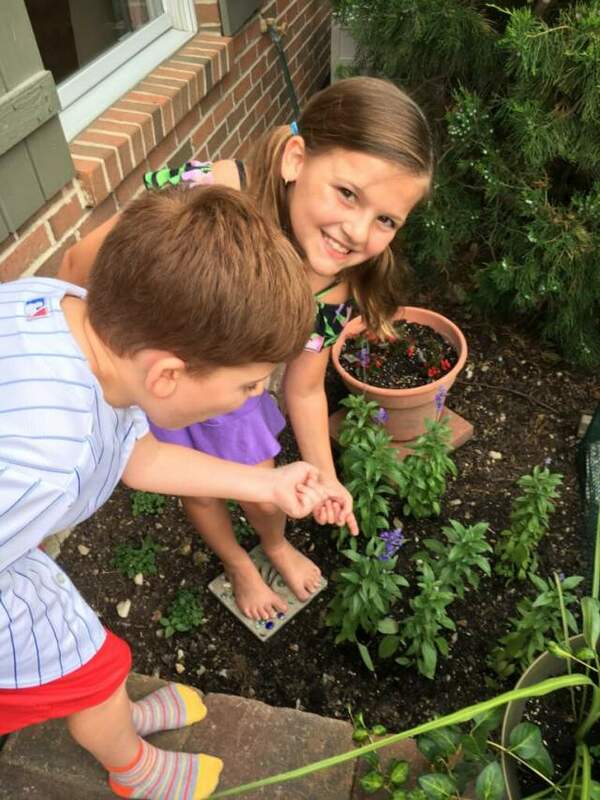 Here is some sage advice about a few of the more common and popular salvias to consider for your garden. Click on linked names for an image. 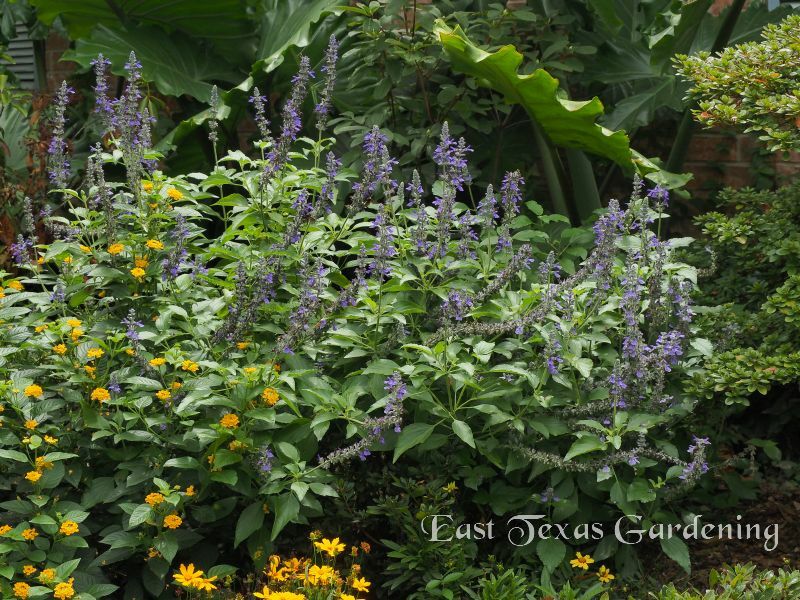 Mealy-Cup or Blue Sage (Salvia farinacea) - A south and central Texas native with spikes of blue flowers that bloom all summer, growing about 3 feet tall. Like many salvias, it looks best if cut back at least once or twice during the summer. ‘Henry Duelberg’ is a Texas Superstar variety discovered and introduced by Greg Grant for its bluer and more floriferous flowers and large, greener leaves than other modern cultivars. Greg also introduced ‘Augusta Duelberg’, a white selection, both found near gravestones bearing the same names. ‘Rebel Child’ is another salvia introduced by Greg who says that even though it is prettier, it’s a little wimpier than Henry, which he likes the best. Blue Sage is not preferred by deer and does best in full sun. 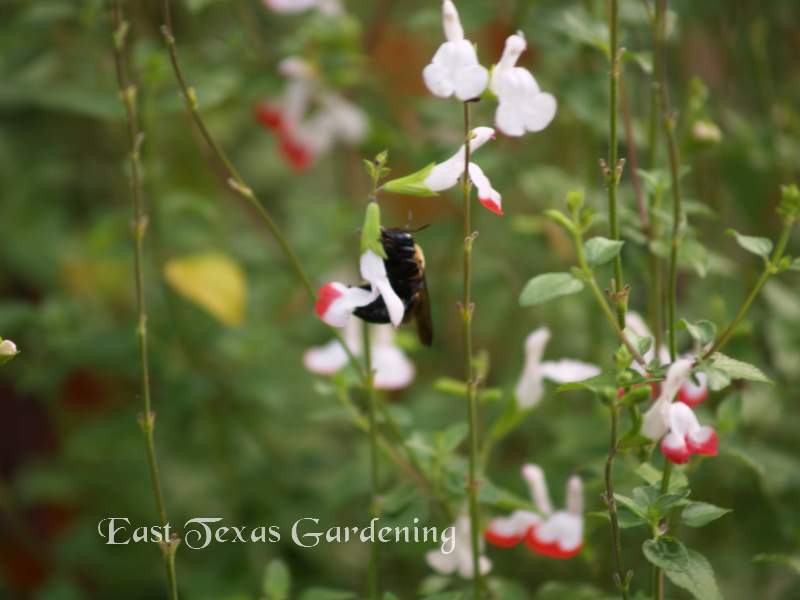 Autumn Sage (S. greggii) - Another native salvia to southwest Texas and Mexico, Autumn Sage is really misnamed because it blooms from spring through fall. While most perennial salvias are herbaceous perennials, freezing to the ground each winter and returning from the crown, Autumn sage is partly evergreen and semi-woody. Growing about 3 feet tall, one or two shearings will keep it compact and flowering. 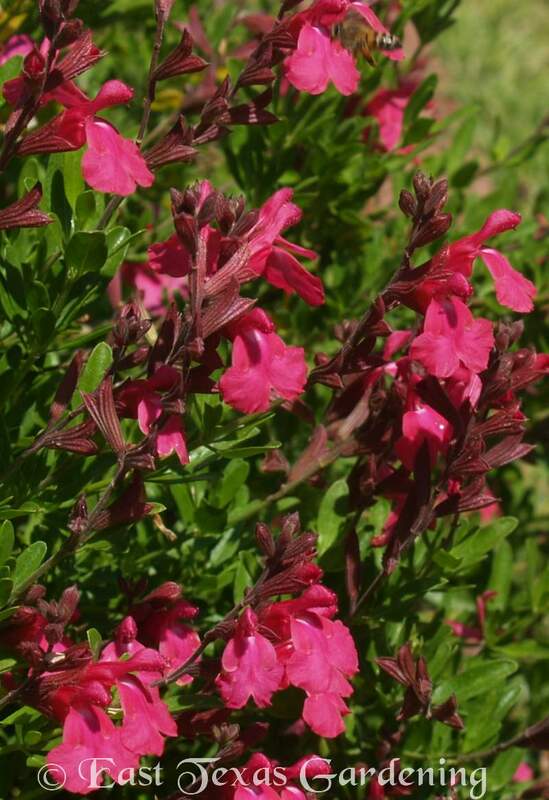 Autumn sage needs full sun and excellent drainage to perform best, and is very drought-tolerant. Flower colors include red, white, pink, rose, purple and orange. ‘Lipstick’ has bright red flowers accented with a white upper lip and throat, which disappears during the heat of summer but returns in the fall to induce both hummingbirds and gardeners. Another bicolored S. greggii is ‘Teresa’, which was found growing as a branch sport on a red salvia in a Texas garden. It has striking white and light purple blooms. Little-Leaf Sage ‘Hot Lips’ (S. microphylla) – This stemmy salvia grows much like S. greggii, but is taller and more robust. ‘Hot Lips’ has bright red flowers with dramatic white upper lips and corolla in the spring and fall, fading to mostly all red during the summer. S. microphylla grows equally well in east Texas as in other parts of the State. There are several other cultivars of S. microphylla, as well as hybrids between S. microphylla, S. greggii and S. jamensis (another stemmy, semi-woody salvia). All are super hummingbird plants. Mexican Bush Sage (S. leucantha) - Unlike other salvias discussed up to now, Mexican Bush Sage blooms only in the fall as the days grow shorter, with an occasional scattered bloom in late spring. The five to six foot tall plant is very attractive even when not covered with long rosy-purple spikes with tiny white flowers, starting in late summer and lasting through first frost. The long shoots with grey-green leaves arch slightly, giving a graceful appearance. An all purple variety is also available. Mexican Bush Sage is hardy in most winters (Zone 7b and south), if mulched for protection and stems are not cut back until spring. ‘Santa Barbara’ is a more compact variety growing to about 2 feet tall with a wider spread. 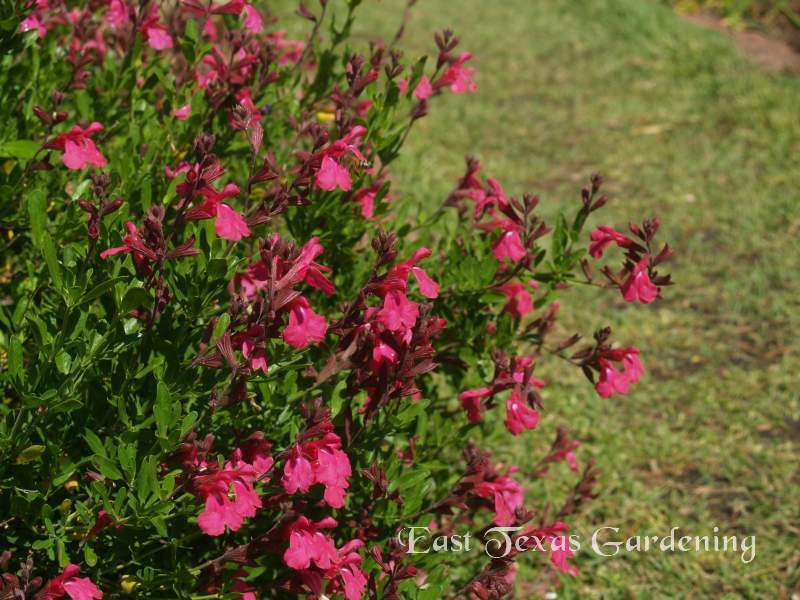 Texas Sage (S. coccinea) - Texas Sage grows about 2 to 3 feet tall and is treated as an annual, though it does reseed freely. The red form is most common, with pink ‘Coral Nymph’ and white ‘Snow White’ selections available. A few years ago, 'Lady in Red' was chosen as an All-America Selections Winner because it is shorter with larger, brighter red flowers. 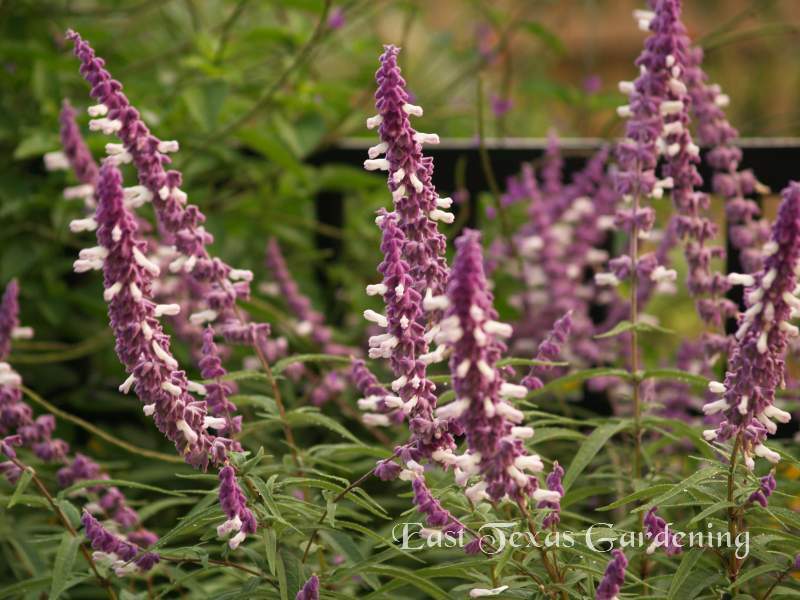 Texas sage does great in shade as well as in full sun. Summer Jewel™ is a new series made up entirely of AAS winners. They are reported to be low growing with a good branching habit, producing a multitude of flower spikes with a long blooming period. Flower colors include lavender, pink, red and white. Brazilian Sage or Anise Sage (S. guaranitica) - Bearing beautiful, dark, electric blue, long, tubular flowers mid-summer through fall, this beautiful perennial deserves a spot among your flowers. As one of its common names suggests, this sage is native to South America. There are several named varieties for this tough plant, including ‘Black and Blue’ and 'Black and Bloom' that sports black calyxes (instead of the typical green calyx) and dark blue flowers. A lighter, sky-blue flower is featured on the variety ‘Argentina Sky Sage’. This species tolerates some afternoon shade, making it a versatile plant for the flower garden. Be aware that it does spread through underground runners, so give it room to roam, or be ready to pull it out of unwanted areas. Pineapple Sage (S. elegans) - This tender perennial performs a dual function giving beauty with its long, bright red tubular flowers, and having fragrant pineapple-scented leaves which can be used in salads, drinks and potpourri. The ‘Golden Delicious’ variety has chartreuse foliage which makes the bright red flowers really stand out. Even though it is considered somewhat tender (Zone 8 and higher), plants in my northeast Texas landscape have overwintered for 5 years. Plant in full sun and well-drained soil. Scarlet Sage (S. splendens) – These are popular bedding plants useful for introducing bright color to the garden. Many varieties are available from scarlet red to pink, purple, white and bicolors. Saucy™ Red and Saucy™ Wine are newcomers to the salvia market, and like other S. splendens are only hardy to about 25 to 30 degrees (so are treated as annuals), but have vibrant red and purple flowers, respectively. Give some afternoon shade for best results. 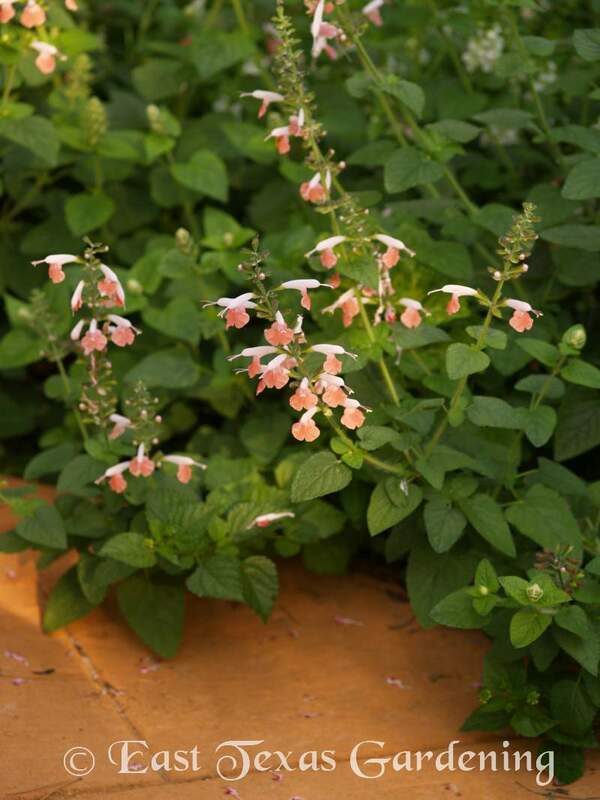 It you are looking for an alternative to impatiens or wax begonias, give this salvia a try. ‘Indigo Spires’, ‘Mystic Spires’, ‘Mystic Spires Improved’, ‘Mysty’ salvia – ‘Indigo Spires’ is a hybrid salvia (a cross between Salvia farinacea x S. longispicata) that was introduced in 1979, and was very popular for many years for its very long spikes of deep blue flowers. Indigo Spires makes a great background plant in the mixed border. Give it plenty of room because it quickly grows to 5 or more feet tall and wide. If given too much summer moisture or rich soil, it will tend to sprawl and flop over. A newer, shorter hybrid with similarly long flower spikes was introduced several years ago called ‘Mystic Spires Blue’, but it still gets about 3 to 4 feet tall in good soil. Newest on the market is an even shorter hybrid named ‘Mysty’ salvia or Mystic Spires Improved, with the same vibrant blue flowers on an even more compact plant. Give them all “haircuts” in early and mid-summer, and again in early fall to help prevent flopping. Darcy’s Mexican Sage (S. darcyi) – This Mexican native was discovered by collectors from Peckerwood Gardens. 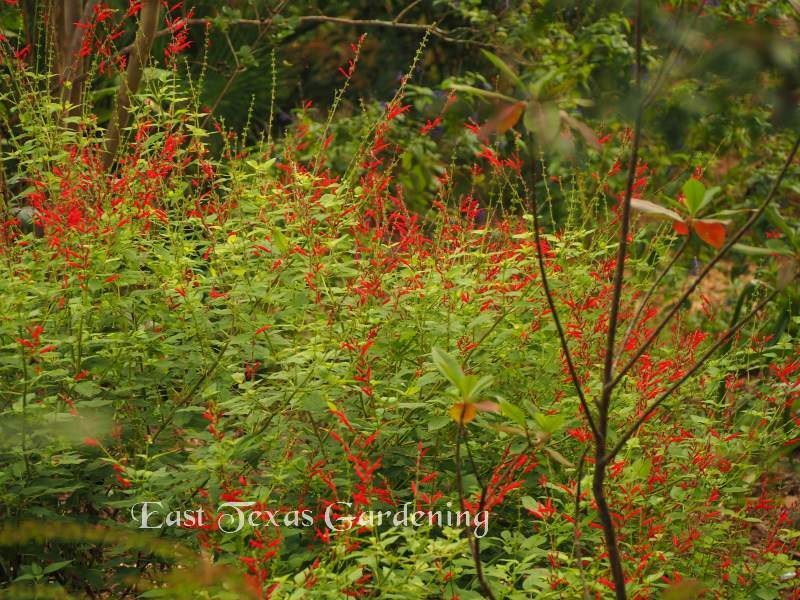 This is a wonderful sage with bright red flowers that are held high above attractive foliage, growing to about 4 feet tall and 5 feet wide. It starts blooming in mid to late summer, providing fabulous color for the garden. It’s a great hummingbird and people magnet for full sun locations. 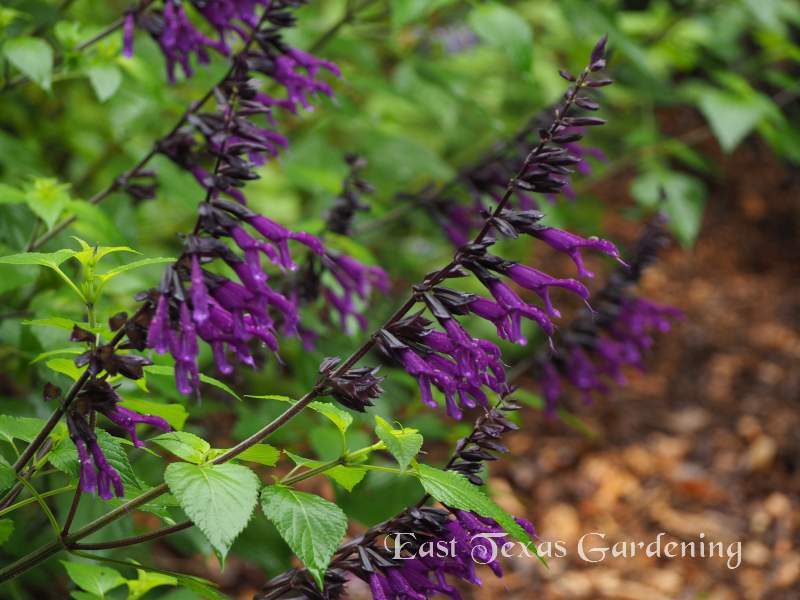 ‘Amistad’ Salvia – ‘Amistad’ is an extremely attractive hybrid sage bearing masses of long, tubular, dark purple flowers jutting out of their black calyxes. The plant is very vigorous, growing to about 4 to 6 feet tall, but does not tend to flop. ‘Amistad’ was introduced a few years ago and has won the affection of gardeners everywhere. 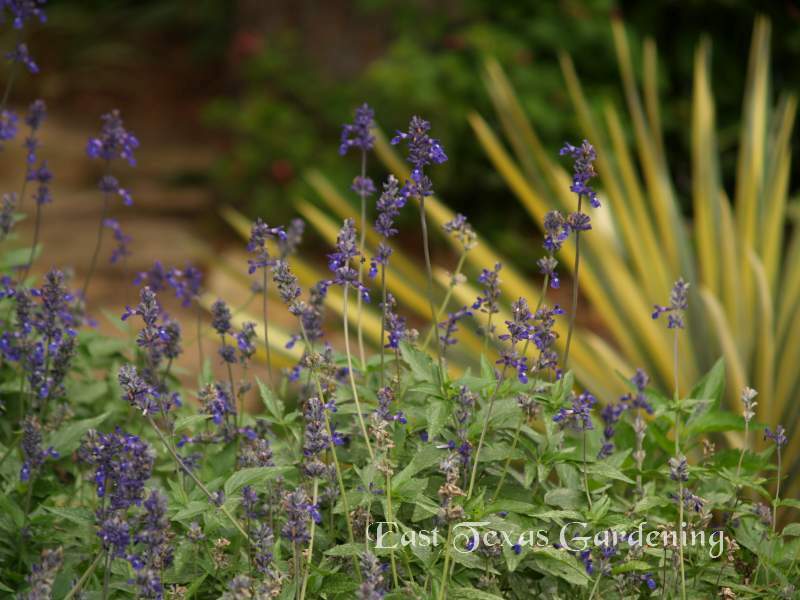 It’s one of my favorite salvias, and Greg Grant claims it is his favorite salvia, too. I mean, who doesn’t love purple? 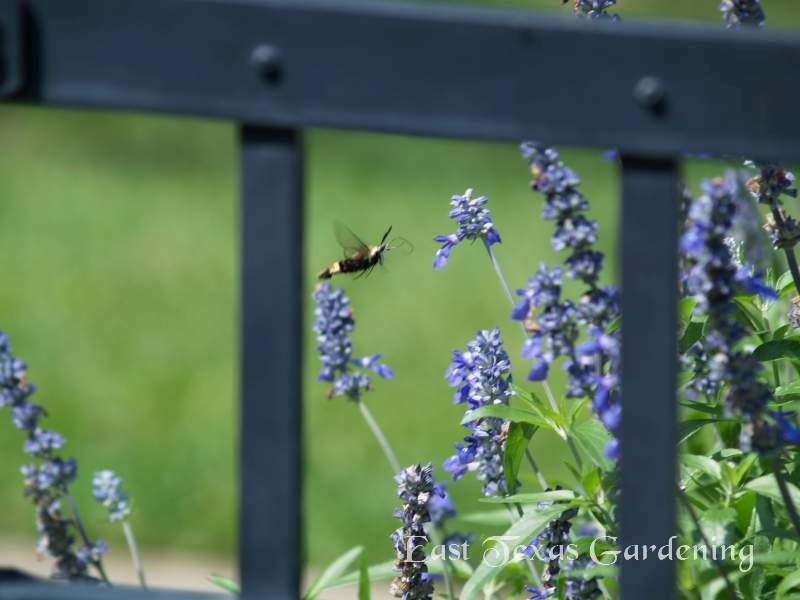 Hummingbirds, bees, wasps and butterflies sure do love this fabulous purple salvia. Cut ‘Amistad’ back a foot or two a few times during the growing season to stimulate more branching and to keep the plant blooming at least at eye level. ‘Ember’s Wish’ (coral flowers), ‘Wendy’s Wish’ (magenta flowers), and ‘Love and Wishes’ (purple flowers) – These 3 tender salvias hail from Australia where they were discovered as hybrids of uncertain origin. The name “Wish” indicates that a portion of sales go to the Australian Make-A-Wish program. We can’t have an article on sages without mentioning culinary sage (Salvia offinialis). 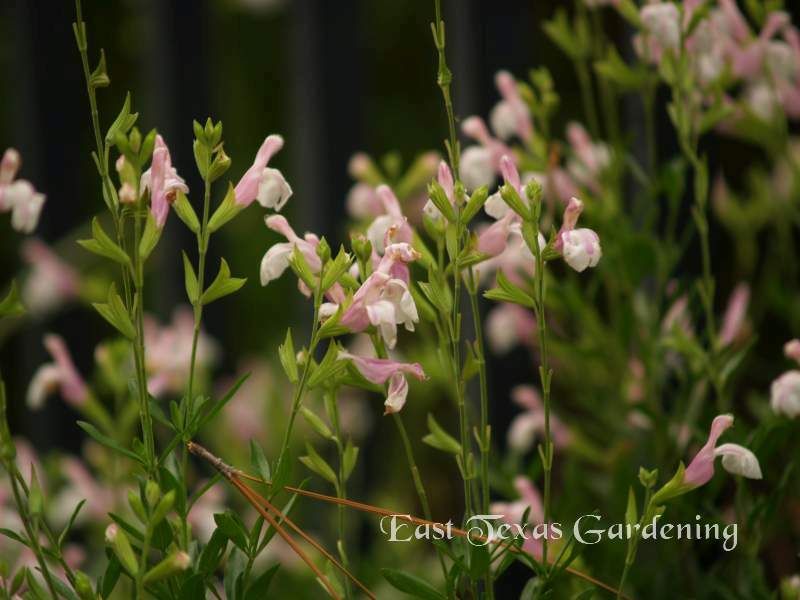 It is native to the dry Mediterranean region, and thus tends to be short-lived in many areas of Texas where heat and humidity is high and soil drainage is poor. There are a few interesting cultivars, including ‘Tricolor’ with the normally grey-green leaves sporting a creamy border and tinged with purple and pink as new leaves are produced. Dr. Brent Pemberton with Texas A&M shared a variety with me that he received from Travis County Extension Horticulturist Daphne Richards called ‘Newe Ya’ar’. This hybrid from Israel is the culinary species crossed with S. fruticose which apparently gives it a wider range of adaptability, so it has done well in central Texas. Mine is less than a year old, but is looking pretty good after the cold and rainy winter we had this year in northeast Texas. Bog Sage (Salvia uliginosa) - Sky blue flowers top this South American saliva which thrives in moist spots (as the common name implies), but does just fine in regular garden soil. Take note that it does spread by rhizomes, so plant in area where that does not matter, or be ready to keep it under control. Grows 4 to 6 feet tall, and has a long season of summer bloom. There are many other species I have not mentioned, plus many other cultivars of species mentioned above, as well as interesting new hybrids of Salvia being introduced in the gardening trade. 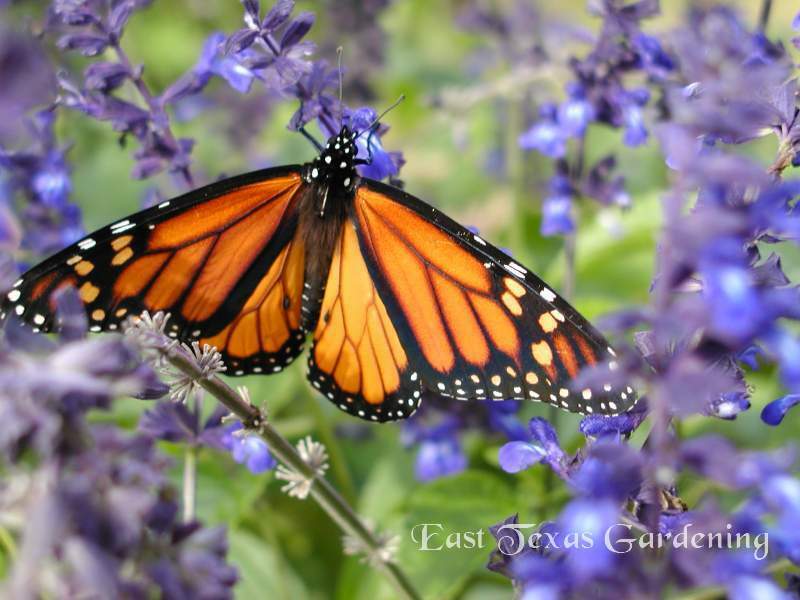 But the ones mentioned here should be relatively easy to find locally or through mail-order and are proven performers for the Texas garden.